Ligatures: A ligature is a combination of characters that’s written as a glyph, that is, as though the characters together are a single character. Most often ligatures are made up of pairs of letters, such as when the lowercase letter f is combined with others. 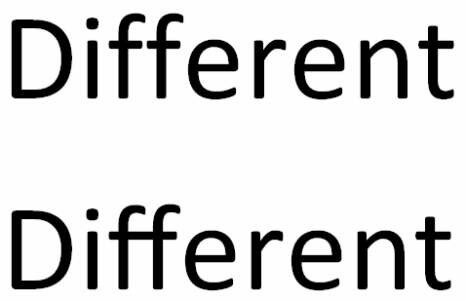 Look at the two lowercase fs in the word different; the first instance of different does not use a ligature, and the second one does. In the ligature version, the horizontal lines on the fs are fused. Number spacing: Number character spacing can be either proportional (in which numbers are spaced like letters, with varying widths) or tabular (in which each number has the same width). Each font has a default setting, but you can override it. Number forms: Numbers can be either lining (not extending below the baseline of the text, and all the same height) or old-style (extending below the baseline or centered higher on the line). Each font has a default setting, but you can override it. 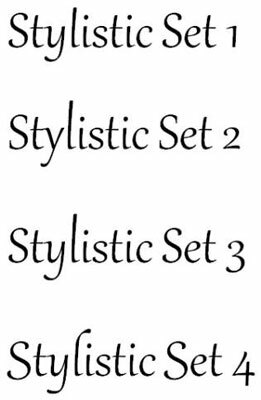 Stylistic sets: Some fonts contain multiple stylistic sets (up to 20), which contain alternatively formed versions of some characters. You can choose among the stylistic sets that a font provides (if any). This is different from Word’s style sets. Contextual Alternates: This feature, when enabled, changes the shapes of letters or combinations of letters based on surrounding characters. This can be used to make script fonts look more natural and flowing, or to use alternative letter forms at the start or end of words or next to punctuation. For more information about OpenType features in Word, see Office. Not all OpenType fonts include all these features. The Calibri, Cambria, Candara, Consolas, Constantia, and Corbel fonts all contain various OpenType features, as does Gabriola, a font that comes with Windows 7. If you have Gabriola available, it’s the best one to experiment with because it contains the most OpenType features. In a Word 2013 document, select a paragraph. On the Home tab, click the dialog box launcher to open the Font dialog box. In the Font dialog box that appears, on the Advanced tab, open the Ligatures drop-down list, choose All, and click OK.
Press Ctrl+Z to undo the action to see how it looked before applying the ligature; then press Ctrl+Y to redo the action to reapply the ligature. Select the any numbers in your document, and then click the dialog box launcher in the Font group to reopen the Font dialog box. In the Font dialog box, on the Advanced tab, from the Number Spacing drop-down list, choose Proportional, review the sample in the bottom of the dialog box to see how the text will change, and then click OK to apply the change. Select another number, and then click the dialog box launcher in the Font group to reopen the Font dialog box. In the Font dialog box, on the Advanced tab, from the Number Forms drop-down list, choose Old-Style, review the sample in the bottom of the dialog box to see how the text will change, and click OK.